The South Downs Way is a footpath and bridleway which is open to walkers horse riders and cyclists. It offers people the chance to ‘get away from it all’ without having to travel too far from a whole host of nearby towns and cities. This National Trail runs for 100 miles from Eastbourne in East Sussex to Winchester in Hampshire or vice versa. It’s a walk full of up and down undulations with over 10,000 feet of ascents and descents. It passes through the town of Arundel, the village of Steyning, then there’s Devil’s Dyke viewpoint near Brighton and mile after mile of rolling chalk downland which offers spectacular views. The Way is completely contained within East Hampshire and the Sussex Downs which has been designated an ‘Area of Outstanding National Beauty’. And, although you’re never too far away from a town or city, much of the Way is unusually isolated and tranquil considering the total population of its neighbouring towns and cities. The East Sussex part of the walk is classic downland with huge skies and panoramic views but as you head west, it becomes more wooded until you reach the rolling Hampshire countryside. People walk it in both directions depending on which side they’ve approached it from alongside their personal preferences. The Way harbours plenty of wildlife including butterflies, sheep and cattle which seem to be with you almost the entire length of the route. And, although the route runs mostly along the crest of the Downs, there are plenty of pretty little villages and pubs to stop off at for lunch along the bottom of the slope. Part of the route also gives you a great view across the English Channel. May, June and September are the most popular months to visit. For many who choose to walk the entire Way, it usually takes between 7 to 9 days. However, if you’re staying in a village each night, you also need to factor in additional time as most of the villages are at the bottom of the hill so you’ll have to add time on for getting down to the villages at night and back up again in the morning. A good ‘off-road’ cyclist will usually complete the trail in about 2 to 3 days, although it has been known to be completed by highly accomplished cyclists in just a day. However, bear in mind that with over 10,000 feet of ascending and descending to conquer as well as the 100 miles of distance, that’s quite some feat! Horse riders should also complete it in about 2 to 3 days and there are plenty of water troughs and car parks with horse box facilities throughout the entire length of the route. For those who like their history, Winchester is a fascinating and beautiful cathedral city which was the capital city of Saxon England. 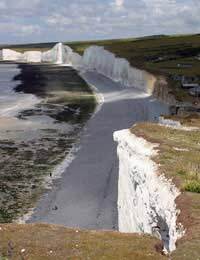 For those who enjoy spectacular coastal walks, nothing comes close to the cliff top walk at Seven Sisters and Beachy Head. Devil’s Dyke, a dry and vast valley overlooking an area of countryside known as the Weald is a popular attraction. This V-shaped valley was formed by the waters of the receding ice towards the end of the last Ice Age and local folklore would have you believe that it was the work of Satan who was digging a trench to flood the whole of Sussex – hence, how it got its name. There are numerous pretty little villages to visit, including Amberley, Exton and East Meon. Amberley, in particular, reminds you of picturesque village postcard scenes and it overlooks the Arun flood meadows. Both Winchester and Eastbourne at either end of the trail are well served by both national bus and train services and there are plenty of other access points on route which are also well served by public transport. The South Downs offers some beautiful countryside, and might well be the best the south can offer walkers. It's an especially good trip in the middle of summer when you can best enjoy the scenery and the scent of the wildflowers on the downs. It's exactly how most people picture rural England, so if you have overseas visitors who like to hike, take them here for the time of their lives.